Andrew B. Freedland - Cooperative and Condominium Law Attorney | Anderson Kill P.C. Rutgers University School of Law - Camden, J.D. Andrew B. Freedland is a shareholder in Anderson Kill's New York office concentrating his practice in real estate and cooperative and condominium law. Andrew's practice focuses on the representation and counseling of purchasers and sellers of commercial and residential real estate, lenders, condominiums, cooperatives and sponsors/developers. As part of his practice, he represents property owners and operators in a wide variety of real estate related issues, including leasing, financing, acquisition and sale of both residential and commercial property. He is also counsel to numerous cooperative and condominium buildings throughout New York City. 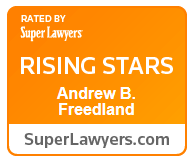 Andrew has been recognized by Super Lawyers as a New York Metro Rising Star for Real Estate since 2016.